A few years ago, a woman approached me after I finished a keynote presentation. In the speech, I had mentioned the importance of living with intention. That point made an impression. She realized she had not been intentional, particularly as it related to her career. As it turns out, she was a doctor with a very successful practice. She was extremely busy and making more money than she had dreamed possible. But she was deeply unsatisfied. “If I’m honest, I think I became a doctor because my father was a doctor. It was expected. I didn’t think I had a choice,” she confessed. Then her eyes welled with tears. She was good at what she did. Her practice was exploding. But she had lost her passion. As I later reflected on her situation, I realized job satisfaction requires three components. Passion. This is where it begins. What do you care about? What moves you? What problems do you want to solve or issues you want to address? If your heart is not in your work, you have a job but not a calling. Proficiency. Passion alone is not enough. You have to be good at what you do. Being good enough will not give you the satisfaction you desire. You have to excel at your craft and be awesome. Mastery is the goal. Profitability. To enjoy a successful career, people must be willing to pay you for what you do. You don’t have to get rich, but there must be a market for your product or service. Otherwise, your career is not sustainable. 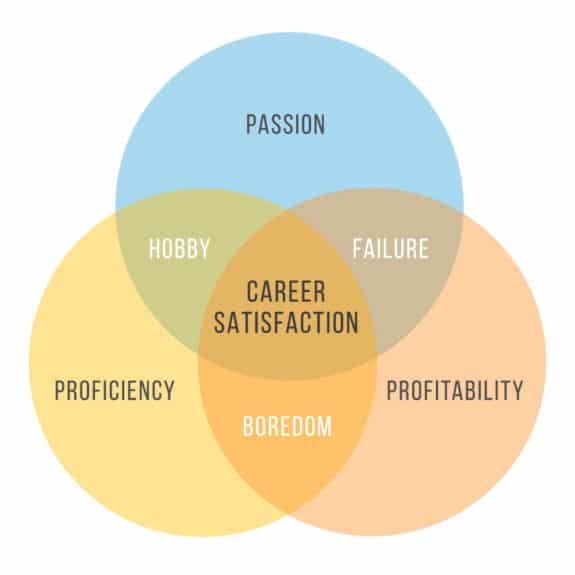 If you have all three of these components, you can experience genuine career satisfaction. Few things in life are more rewarding. I envision it as three overlapping circles. (Jim Collins has a similar model in Good to Great as it applies to companies.) At the intersection of all three is true success. If you have passion and proficiency without profitability, you have a hobby. We all know people like this. Living in Nashville, I know musicians who love what they do, and are accomplished on their chosen instrument, but can’t pay the bills. If you have passion and profitability without proficiency, you have failure. If you aren’t willing to put in the hours honing your craft, it will eventually catch up with you. You will struggle to get hired, or simply be flushed in the next round of layoffs. If you have proficiency and profitability without passion, you have boredom. This was the doctor’s problem. On the surface she had it all. But in her heart, she was missing the one piece she needed to find satisfaction in her work. You can get by for a time with only two of the three elements I have described. Sometimes, for instance, it takes a while to build proficiency. Other times we invest our best efforts believing that profitability will follow. But that can’t work forever. If you want to succeed at the deepest level, you must eventually incorporate all three components. A while back I heard from a doctor in a similar situation as the one from before. She worked for a major corporate practice. It was like a factory with patients on a conveyor belt. She hated it. She had zero passion for her job. So she quit! She started a boutique family practice of her own. Instead of the constant pressure to see more patients each day than the last, she now has fewer patients and can spend more time with each. And guess what? She’s reconnected with her passion and loving her work again. That’s the kind of difference being intentional about our careers can make. Question: Do you possess all three of these components? Which is missing? What could you do to become more satisfied in your work?